Generous portion and tender, flavorful meat make Grill Kabob one of the editor’s top go-to spots for kabob, particularly the kobeeda (ground beef), in the county. Workers on their lunch break may not enjoy the stroller scene, but the nearby carousel offers entertainment for preschoolers while Mom enjoys a break from fast food fare. The Afghan owners of Grill Kabob…obviously know what they’re doing. I Am Modern: Best kabob you will ever eat in Northern Virginia, and OMG, it’s in the mall! You are in the mall and your feet are aching. You spent way too much and you didn’t even buy what you came in to get. Kids are screaming more than usual. Wait. There is bliss right around the corner and it’s called Grill Kabob. We can hear Gregorian chants as we say the name. When we eat there, we are one piece of baklava away from heaven. The Middle Eastern eatery is a mom’s dream come true. They are renown for their chicken kabobs. They serve the juicy tender pieces of white chicken meat chargrilled over an open fire and served over two types of rice, one spiced and one perfectly buttered. All platters are served with salad that is drizzled with the “I know this isn’t low fat” dressing. They also include a small cup of the dressing on the side. We could easily drink it, it’s so good. You can usually ask for an extra side of the sauce, but if the lady with the glasses is there, you have to pay. They make the bread onsite, and it’s always delicious and right out of the oven. Their gyros also deserve special mention. They include minced spiced meat shaped into a big cone, slow cooked while being rotated in an electric gizmo, and are served thinly sliced over rice or salad. Always hot, juicy and perfectly satisfying. 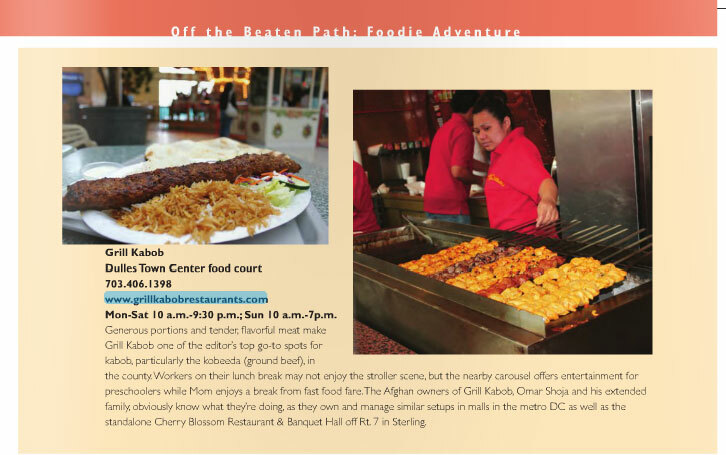 Grill Kabob serves the best kabob in town – sometimes we find ourselves in the mall just to eat there. The beauty is, your kids thank you for it.